If you want freedom over how you work, you need to first give yourself permission to listen to yourself. Get ready to challenge yourself because Nita Baum and I spend a lot of time swimming in the deep end of the pool discussing how self-awareness, abundance, mindset and reflection lay the foundation for personal liberation! Nita is the founder of b*free. Her company offers immersive collective learning experiences that ground freelancers/solopreneurs by equipping them with the mindsets, skills and tools to build sustainable businesses and live more freely with the support of community. Why we avoid self-reflection, even though it’s a crucial component to our success. Give yourself permission to define your own version of meditation. How to tell you are out of alignment with your work. Wake up time: About 7:00 am, but it varies. Core work activities + habits: 1) Be present in her interactions with co-creators. 2) Be present in interactions with her cohorts. 3) Build in time to stop her mind in order to listen to her deeper guidance. Ideal work environment: Sometimes in solitude, being in nature, taking calls while walking; sometimes in collaboration with people both live and over online conference calls. 90-day goal: To keep to the integrity of the company values in the face of their expanding opportunities and remember their priority to help every individual improve. 1) Work with the ecosystem of you. Make a list of all the people and communities you already know and categorize them into categories that are meaningful to you. 2) Engage with those people with whom you have a strong affinity and start there. 3) Ask for introductions. If they have a high affinity for you, then they can help plug you into other people and communities to help you learn about yourself. 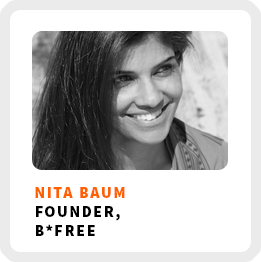 For folks based in NYC or if you feel like traveling there, get a free invitation to 2 live events hosted by Nita and her team in Fall 2017/Winter 2018 by emailing info@bfree.live, to get a discount code.